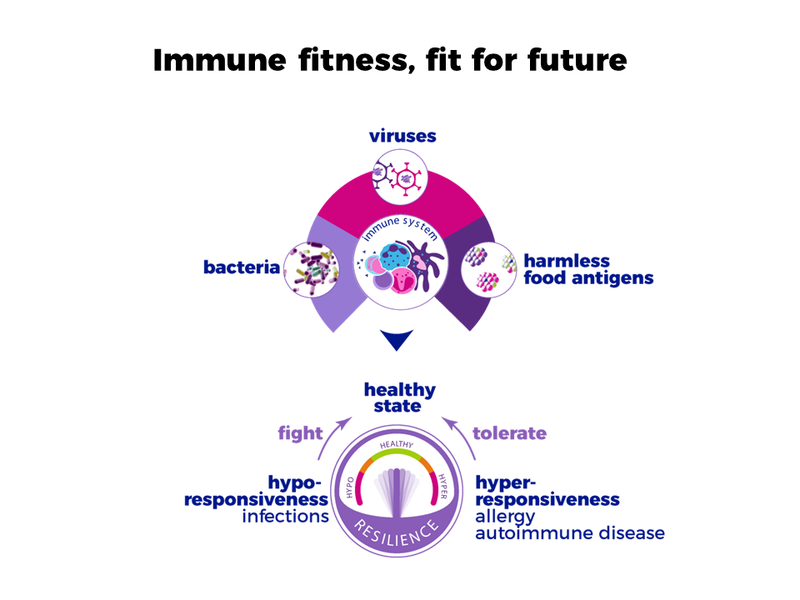 Immune fitness is a state where an individual’s immune system is resilient, having an inbuilt capacity to adapt to challenges by establishing, maintaining and regulating an appropriate immune response. Resilience is the capacity of the immune system to return to homeostasis – a healthy state of wellbeing – after an external challenge. 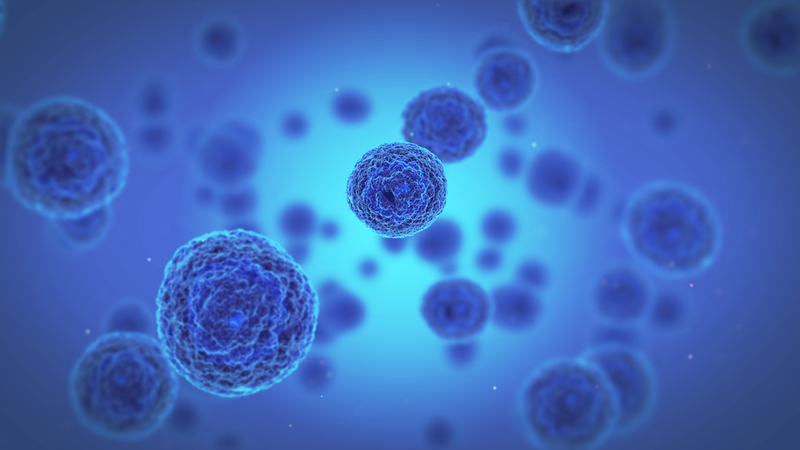 An appropriate response of the immune system is to eliminate a harmful agent, such as bacteria and viruses, but tolerate harmless ones, like food. This immune response should be of an optimal strength: not too weak, which will increase the risk of infections, or too strong, potentially resulting in allergy, chronic inflammation, or autoimmune disorders. 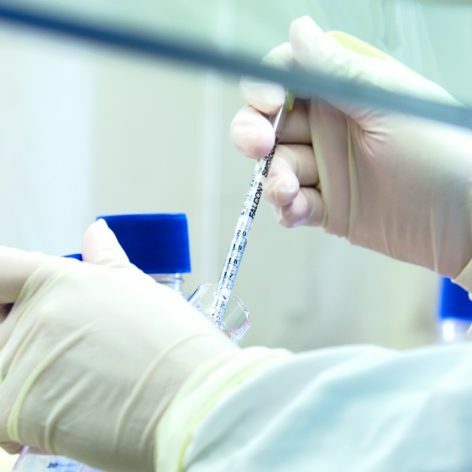 The immune system has influence over most of our physiological functions and so factors that impact our immune development can also have an impact on our health, both in the long and short term. • Long-term: having an allergy early in life predisposes a person to having other, secondary allergies later in life (the ‘allergic march’). Allergies and other NCDs (e.g. obesity, diabetes, cancer) have in common an underlying low-grade inflammation3 and our immune systems will influence their development.4,5 A fit immune system is more able to cope with external factors and so can protect the body against the development of NCDs. What contributes to Immune Fitness? 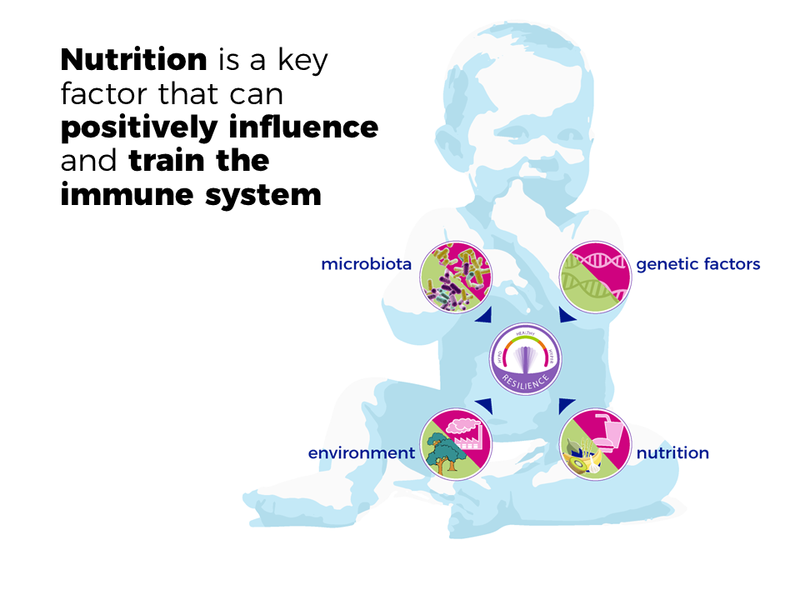 Early life presents a unique window of opportunity to influence the development of the immune system, including training it to elicit the appropriate immune response to external stimuli. 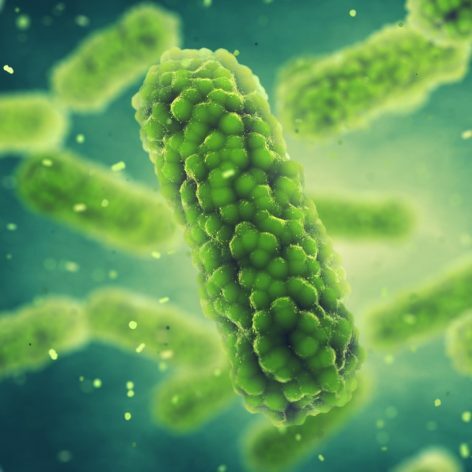 As well as family history, there are a number of external factors related to modern life that can challenge the developing immune system by causing a gut microbiota dysbiosis. 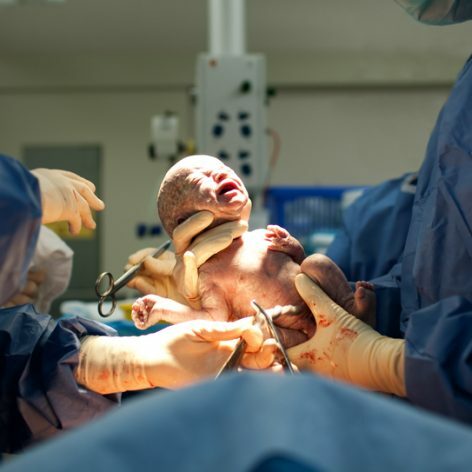 These include C-section deliveries, overuse of antibiotics, as well as westernised diets and air pollution. 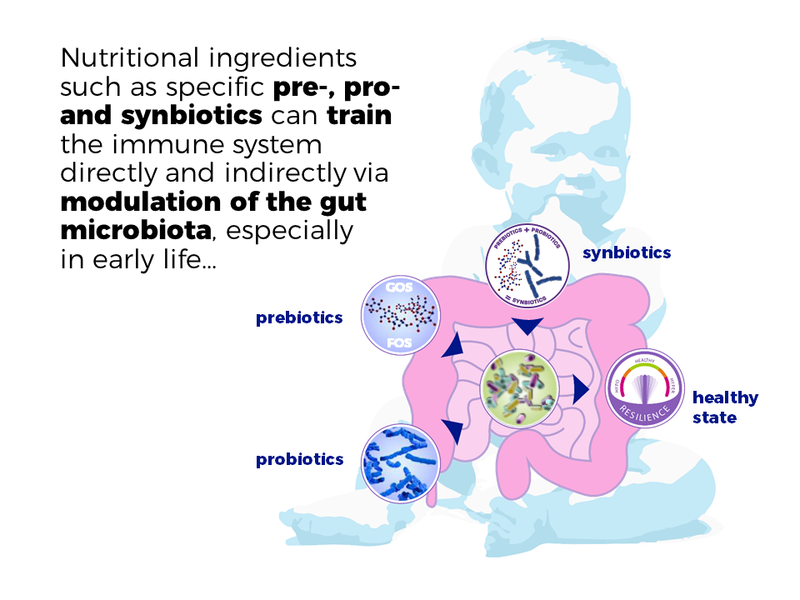 Nutritional ingredients such as specific pre- and probiotics to can positively influence the immune system directly9 and indirectly via modulation of the gut microbiota9–13 creating the optimal conditions for the immune system to be fit. Pawankar R, et al. WAO White Book on Allergy. 2011, Wisconsin . Sackesen C, et al. Curr Opin Allergy Clin Immunol, 2011;11(3): 243-48. Prescott, SL. J Allergy Clin Immunol, 2013;131(1): 23-30. .
Calder PC and S Kew. Br J Nutr, 2002;88(S2):S165-S176. Dietert, RR. Dev Reprod Toxicol, 2014;101(4): 333-40. Abrahamsson TR, et al. J Allergy Clin Immunol, 2012;129(2):434-40. e2. West CE, et al. J Allergy Clin Immunol. 2015;135:3-13. Lozupone CA, et al. Nature, 2012; 489(7415): 220-30. Lehmann S, et al. PloS one, 2015;10(7);pe0132304. Druart, C, et al. Adv Nutr, 2014;5(5):624S-33S. Wopereis H, et al. Pediatr Allergy Immunol, 2014;25(5): 428-38. Rachid R and Chatila TA. Curr Opin Pediatr, 2016;28(6):748-53. Muir AB, et al. Allergy, 2016;71(9):1256-63. Rigo J, et al. Ciencia pediátrika, 2001;21(10):390-96. Moro G, et al. J Pediatr Gastro Nutr, 2002;34(3):291-95. Schmelzle, H, et al. 2003;36(3): 343-51. Rinne MM, et al. FEMS Immunol Med Microbiol, 2005;43(1): 59-65. .
Haarman M and Knol J. Appl Environ Microbiol, 2005;71(5):2318-24. .
Wopereis H SK, et al. J Allergy Clin Immunol, 2017. Accepted for publication. Moro G, et al. Arch Dis Child, 2006;91: 814-19. .
Arslanoglu S, et al. J Nutr, 2008;138(6):1091-95. Scholtens PA, et al. J Nutr, 2008;138(6): 1141-47. Bruzzese E, et al. Dig Liv Dis, 2006;38:S283-87. .
Boyle R, et al. Allergy, 2016;71: 701-10. .
Boyle R, et al. Clin Transl Allergy, 2015;5(S3): 30. Abrahamse-Berkeveld, M, et al. J Nutr Sci, 2016;5(e42): 1-13. .
Chatchatee P, et al. J Pediatr Gastroenterol Nutr, 2014;58(4):428-37. Chien CM, et al. Julius Study, jENS. 2015. Budapest.